©2016 C. J. Cherryh (P)2016 Audible, Inc. I have downloaded this both through the audible app and through the audible website and both downloads are missing sections from the book. Most notably this includes the last two chapters of the book. This is very disappointing. I hope this is simply a minor issue that will be resolved as up to this point I was enjoying the book immensely. Edit: I have listened to this book again a year later and the missing chapters issue has been resolved. Not impressed. Chapter 20 is corrupted, won't play past Ch 20 + 4 mins on my iPhone. When played on Audible PC software (Widget, Win 10) it seems like some of the story has been skipped. Quick search on internet shows many other Audible customers have the same problem with the same file, many also report the story seems to have skipped a bit. I always enjoy the audiobooks from this series, unfortunately, in this case a huge chunk of the story is missing. It cuts out in the middle of chapter 20 and jumps ahead, skipping (as far as I can tell) multiple chapters and key events. The result is pretty much completely incoherent. It amazes me how I can be entirely engrossed in each of the Foreigner series books even when nothing much (as viewed from the outside) actually happens. And when it does. Wow! This book had a major unexpected twist that turned the series on its head, and made it even more interesting. No spoilers here, but I loved it. Cherryh's ability to get so deeply into the minds of the characters can sometimes be difficult to endure. But as someone with a busy mind I can only say that it's familiar to my own thought processes and I've gotten to know the workings of the characters well. And there's always something new to learn and surprises here and there. They aren't unpredictable, they're complex. As always, Daniel Thomas May narrates the story perfectly. He delivers each character well, and considering he has 3 different species' words to deliver he does it superbly and that's quite an accomplishment. Now I'm stuck waiting for the next in the series! Good story, fresh twist, still loving the series! What made the experience of listening to Visitor the most enjoyable? I have loved this series since the beginning many years ago. Listening/reading the first novel Foreigner, from so long ago, it's now easier to pick out the "dated" references to technology no longer relevant. I love how the newer novels subtly update this. This installment also has a twist that has me still looking forward to the next book, even after all these years. For those that said their downloads seemed to be missing parts of chapters, my download was complete and free from glitches. I purchased and downloaded 07Apr16. Mr. May's narration was as excellent as ever. Visitor is the most recent novel in Cherryh's fascinating story of politics and cultural clash in interstellar space. By now, the reader is art home with a wide cast of characters, factions, communities of interest and personalities. Developments in Visitor are unexpected and compelling -- but don't start here. The back story is essential, the personalities of major and minor characters have been painstakingly developed over time, and the entire series is worthy of time, credits and attention. There is a good bit of intellectual speculation -- a virtue, in my view. When is the next book? I can't wait. Great series. When is the next book? I can't wait. Great series. A true fan and would love to live in it. Foreigner is hands down one of my favorite science fiction series. So much subtlety, so much of a character journey across the course of the books. 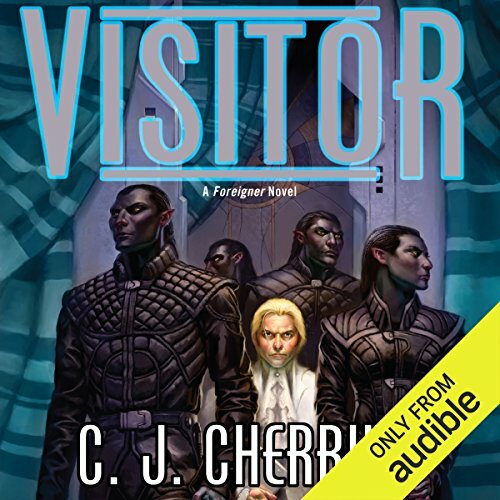 I wasn't sure how Cherryh would top the other books, but Visitor blew me away. This book brings everything together and shoots it off in a new direction that I never saw coming. I can't wait for the next one! Narration, as always, was superb. If you're this far into the series, I probably don't even need to recommend this book, but if you need an extra nudge - go read it. Read it now. You won't regret it! The story could end here but has been left with the option of continuing. Hope it does! I love this series. The earliest downloads of this book were missing two large chunks of text -- about 60 pages, in all. The download now available is complete. Excellent, startling, thought-provoking addition to the Foreigner series. Another awesome chapter in the Foreigner Saga. Once again Cherryh gives us a great story from the Foreigner Universe. My only issue is that she is still "filling" space with repetition after repetition of the same background information throughout the book. I have read every book in the series, one short chapter at the beginning giving a brief summary to this point is enough, even for people reading this book as their first. Every book is like a visit with old friends. I am excited when it begins and sad when it ends. I have read all of these books as they were released and have enjoyed getting to listen to them also. It is a fantastic world with believable characters. I loved it! First time through there was a glitch resulting in missing chapters. Support replaced it and it worked fine. Very fast response and on a Sunday! After the usual back story material, the adventure takes off and the ride is a good one! The performance, as usual, was excellent. Also as usual, the new material makes me want to read it all again!